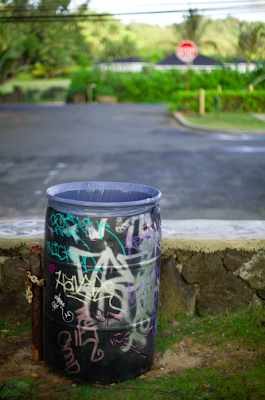 Pics and Kicks: Pounders Trash Can. I LOVE Pounders, though I just realized that I have not been swimming there for over 5 years. Last time I was there the ocean tried to eat Raleigh, and I guess I never forgave her. . . him. . . is the ocean a boy or a girl? Well I think that it's a her, considering she's mother earth and all. BUT there is always King Triton who rules the sea so I guess it could go both ways. cool photo! I've always thought of him as a him. Tangaroa, in Maori, means God of the Sea and it's a boys' name. Random. i think it changes genders depending on the break. so i guess sometimes it's just a limp-wristed boy. Ha ha, makes me think of last week as we drove towards the coast and came in view of the ocean my j-man yell "yah! I see the ocean (remember, we live on an island...not that big of deal, right?) I renember HIM!" OH what i wouldn't give to be next to that trash can. Pounders is most definitely one of my favorite places in the world. My "happy place" is being pounded by its filthy water with what I call the Ninja Turtle sewer bubbles floating on top. (Well maybe not as much when its fiflthy but I just love pounders so much) I love this picture. I want it framed in my house.